The Dynomax brand is an offshoot of the Walker Exhaust company, offering performance cat back exhaust systems and mufflers. 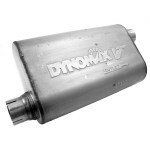 Although Dynomax offers an extensive line of exhaust products for cars such as the Ford Mustang and Chevrolet Camaro, some of their most popular items are designed for trucks and Jeeps. 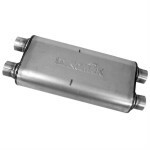 If you are looking for an affordable aftermarket exhaust, I’d add Dynomax to your wish list. As you’ll see below, they build quality exhaust systems at an attractive price. This is a combination you’ll rarely find in the ultra-competitive performance parts market. If you’ve spent anytime researching replacement mufflers or catalytic converters, I’m guessing you’ve heard of the Walker brand name. 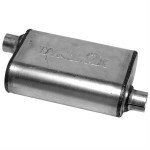 They have been in business since 1908 and designed the first louvered muffler in 1932. Today, they manufacture low cost OEM and replacement exhaust parts for just about every make and model of car or truck out there. However, in 1987 Walker decided to jump into the quickly growing performance exhaust market. They launched their new line of cat back exhaust systems and performance mufflers under the Dynomax Performance Exhaust brand. 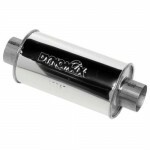 Dynomax mufflers are a great upgrade if you are looking for a high quality exhaust without spending a fortune. 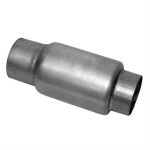 Each muffler is constructed from micro-finish stainless steel and carefully welded together. Inside each muffler you’ll find a straight through design with continuous roving fiberglass packing. If you purchase a Dynomax cat back exhaust system, you can be confident that it will last for years to come. After all, each exhaust kit is built with stainless steel mandrel bent tubing. 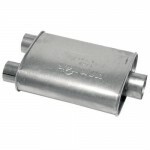 Most Dynomax customers are looking for an inexpensive exhaust to replace their rusted stock exhaust. However, if you are looking for additional performance and an aftermarket sound, I would suggest looking at Magnaflow or Borla instead. After talking to many Dynomax customers and reading hundreds of reviews online, I was surprised to find very few complaints. That’s not to say I didn’t find any, but less than I expected. When you are dealing with a low cost brand like Dynomax, it’s not uncommon to find complaints about the product quality. Among the complaints that I did find were mostly people that expected to get Magnaflow quality at a Dynomax price. I believe it’s unfair to hold these products up to such a high standard, considering the lower construction quality and affordable price point. However, most customer reviews I read were very appreciative of the quality they received at an inexpensive price. Another complaint that came up often was the sound level of the muffler. Dynomax mufflers and cat back exhaust systems are definitely an upgrade over stock, but they might not sound much louder. 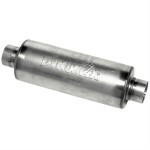 In fact, many customers reported their Dynomax mufflers to be about as loud as the stock muffler. A few were expecting their new muffler to be much louder. Keep this in mind if you are shopping for an exhaust system with a much louder volume. If you are looking for a replacement muffler or cat back exhaust at a great price, then Dynomax might be a great match for you. 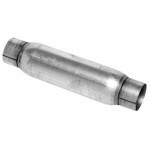 They offer stainless steel exhausts and welded mufflers that can replace your wore and rusted stock exhaust. Each exhaust system comes with all of the clamps you’ll need to replace the exhaust yourself. That being said, if you want a louder exhaust that delivers lots of horsepower you should look elsewhere. Brands you might consider include Magnaflow, Flowmaster or Corsa exhaust systems. Dynomax mufflers are built in the same factories as Walker emissions products, so you know they’ll fit your car or truck without much trouble. That’s because Walker not only produces replacement parts, but they are the OEM supplier for many manufacturers as well.